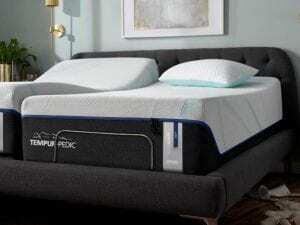 The TEMPUR-Pedic LuxeAdapt Firm represents a luxuriously elevated ultimate TEMPUR® experience. This new advancement in technology and comfort delivers maximum pressure relieving power, superior motion cancellation, and one-of-a-kind technology. The combination of these features with TEMPUR-Pedics new groundbreaking material which intuitively adapts to your unique body shape in ultra-conforming comfort makes the new TEMPUR-LuxeAdapt Series one of the most exciting things to come out of the mattress industry in years! The LuxeAdapt mattresses have the all-new Advanced Pressure Relief Plus (Tempur-APR+) material. This serves as the primary comfort memory foam layer. The APR+ foam provides increased performance over their existing materials. It improves body adapting comfort and reduces partner motion. In addition, the LuxeAdapt beds have the premium SmartClimate Dual Cover System. The cover is made of heavy yarn and delivers a cool-to-the-touch sensation when you touch the cover. The cooling effect isn’t from nasty added chemicals; it actually comes from the physical properties of the heavy wool itself. It’s also removable and washable so it’s very practical. The third layer within the LuxeAdapt pressure relief system is the comfort layer. Its rougher cell structure gives the bed a softer feel. It works in conjunction with the other layers to support and relax your body, resulting in the ideal soft yet supportive sleep experience. 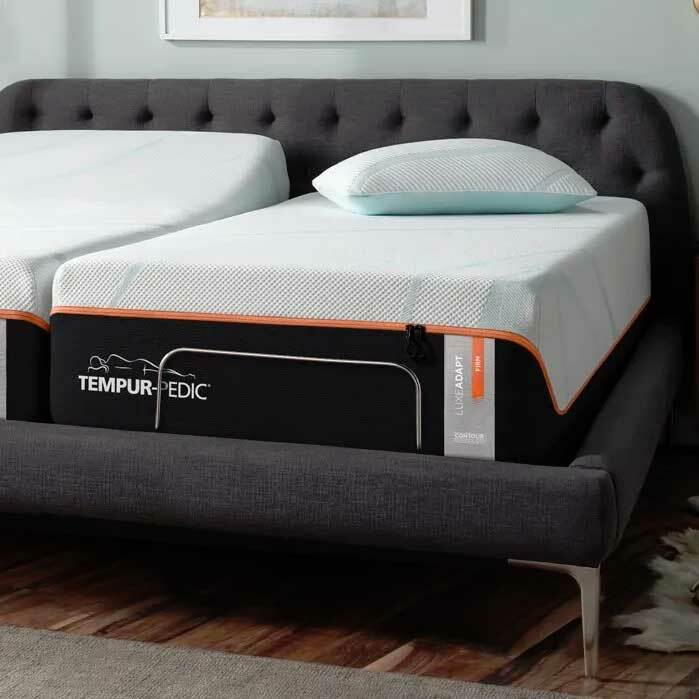 The TEMPUR-Pedic LuxeAdapt series comes in two firmness options, soft and firm. The experts at TEMPUR-Pedic have selected the firmness within Goldilocks zone for each option, not too soft, not too hard. Simplifying the process of deciding whether you need a firm or soft mattress makes your life easier! Almost all sleepers will find one of these two options to be best for their life. For sleepers who don’t tend to deal with back pain, a firm mattress will often be the more comfortable choice. When sleeping on a surface thats more firm than soft, the weight and pressure of your body is absorbed by your skeletal structure, meaning there is less stress on muscles, veins and arteries. The result is muscles that are less strained, and circulation improved. A firm mattress also helps prevent your lower back from collapsing. Maintaining proper back alignment while sleeping allows for more oxygen intake while sleeping. 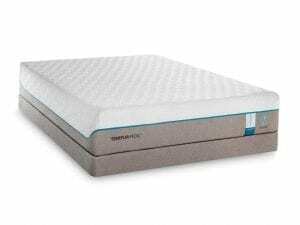 Does Brand Name Matter With Mattresses? There are two main differences between a brand name like TEMPUR-Pedic and almost every other brand on the market. TEMPUR-Pedic produces all of their own materials in their own facilities. This speaks to the degree of expertise the hold and to producing exactly what they feel is best for their customers. Most mattress manufacturers get their material from suppliers. Second, TEMPUR-Pedic has always been a producer of premium quality materials and products. Most brands have a cheap option made with cheap materials and the quality, in the long run, fails to hold up. TEMPUR-Pedic has earned their famously positive reputation and their place as the largest manufacturer in the world because their products are always made with premium materials. Why Should You Experience Tempur-Pedic? Choosing a mattress has often been an overwhelming and confusing experience for the average consumer. There are so many different brands, all with their own varying price ranges and features it’s hard to know how a bed you try for 30 seconds in the store will perform over the next 5 to 10 years. For most people though the decision comes down to 1 thing, comfort. Having a sleep expert who is Tempur-Pedic Elite certified matters because they can simplify all the details help you balance comfort now, with support over time. Tempur-Pedic knows this all too well, which is why they developed a mattress that will stand the test of time and improve your quality of life by giving you a better nights sleep. Now Tempur may sound like a generic type of memory foam but it’s the only mattress material that sleep scientists have created that will help promote a healthy night’s sleep. Having been developed by NASA to save astronauts lives, it has undoubtedly saved millions of Americans from restless tossing and turning throughout the night. As reported by the Blackstone Group, the Tempur-Pedic Owner Study conducted in 2012 determined that 93 percent of users love their Tempur-Pedic mattresses; in fact, over 90 percent of them said that they would purchase a similar Tempur-Pedic mattress in the future. Selecting a new mattress is a significant decision. At Best Mattress we know how important a good night’s sleep is and we guarantee that you will sleep comfortably on your new mattress. If you are not satisfied with the comfort of your mattress within 120 days of your purchase, we will do whatever we can to make sure you are sleeping well. Best Mattress is committed to helping you find the right mattress and to your healthy night’s sleep. Best Mattress is proud to be a Tempur-Pedic Elite Retailer and offers some of the best services you’ll find anywhere in the Las Vegas, Mesquite, and St George areas. Come in and experience the difference that shopping at an Elite Tempur-Pedic Retailer can make. Our sleep experts are eager to help you find a better nights sleep! You deserve it!